Through EES’ STEP Combustion platform, EES provide cost effective combustion based NOx reduction. STEP provides an economical step wise approach to NOx reduction through the layering of complimentary combustion zone technologies which are effective for NOx reduction and increasing combustion efficiency. In furnace NOx reduction methods including low-NOx coal, gas and oil burners, over-fire-air, flue gas recirculation, windbox modifications, reburn, and fuel/air balancing, are evaluated in order to establish the most efficient options. Further application of post combustion technologies by STEP such as SNCR and SCR provides a complete approach. STEP Combustion’ core expertise is emission control technologies for gaseous, liquids, and solid fuels, including combustion and post combustion NOx controls. STEP believes that each unique application merits the evaluation of capital and operating costs to determine the optimal compliance strategy for each application. STEP Combustion’s over-fire-air (OFA) system designs provide NOx reductions of up to 35 % in typical applications. Typical over-fire-air designs use 20-30% of the combustion air downstream of the primary combustion zone to deeply stage combustion beyond staging achievable with low NOx burners alone. STEP Combustion has extensive experience designing and optimizing OFA technologies applied to a wide range of boilers burning oil, gas, coal, and biofuels. STEP Combustion’s OFA port designs ensure good air/fuel mixing and carbon burnout throughout the boiler load range. STEP often utilizes a split OFA port design to better control and tune the OFA momentum. 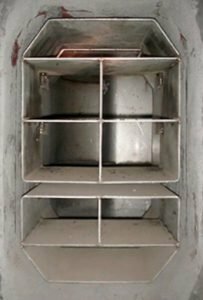 The specialized ports are designed to inject combustion air at the required velocity and direction to complete combustion prior to the furnace exit throughout the boiler load range. 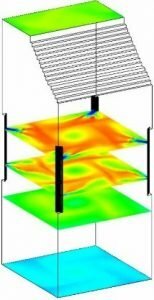 Based on furnace access and CFD model results, tilting (vertical) and yawing (horizontal) port arrangements are utilized. OFA port locations, sizing, direction, and other conditions are determined through empirical data and verified through extensive CFD Modeling. Accurate and realistic CFD modelling of the furnace provides calculation and visualization of over-fire-air mixing with the furnace gases and the resulting CO combustion and NOx reduction in general, the higher the available pressure, the higher the velocity and momentum and as a result, penetration and mixing, and over-fire-air performance are improved. Where necessary due to combustion air and pressure availability limitations, STEP Combustion also provides boosted over fir air systems. Boosted OFA can be used to enhance NOx performance and is evaluated based on NOx requirements, and space and economic considerations.